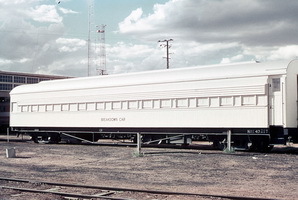 Composite sleeping car built at Port Augusta Workshops. Similar to "NRC36" but the entrances were closed. NRCA 47 was originally numbered "NRCA 38", but due to duplicate numbers existing on the North Australia Railway and Central Australia Railway railways it appears to have been renumbered to "47" sometime between 1947 and 1951. 6.6.1942 Entered service as "NRCA 38". 21.2.1957 End was fully enclosed to provide a shower compartment. 14.10.1966 Recoded "NEX" for use in breakdown consist. 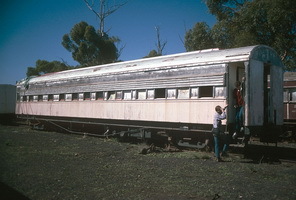 - In Alice Springs breakdown train until 1978 as "NXE 47" then stored at Marree. 28.10.1980 Written off and sold to Pichi Richi Railway.